I thoroughly enjoy compiling the top pinned images of the month post, and this month’s post is full of inspiring architecture, interior and landscape images, and many great ideas. There were so many images that had a high number of pins, so I had to set the bar high and still came up with 40 images. I hope you enjoy this visual feast! Sources noted where possible. 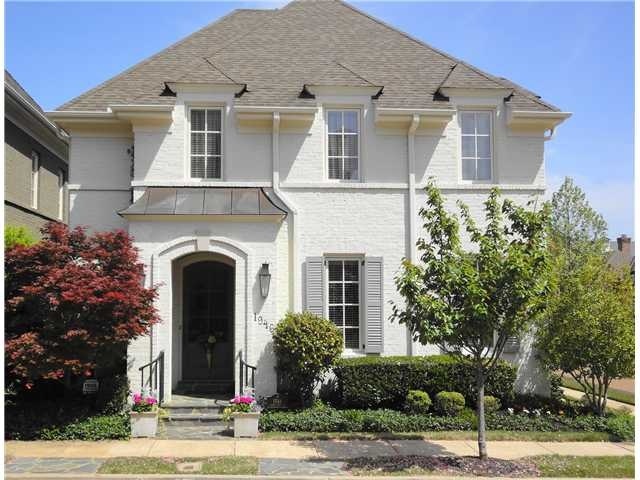 I didn’t include this on my painted brick post because I could not verify the colors, but on Pinterest they are noted as BM ballet white on the brick, SW 50% dovetail on the shutters, and SW brainstorm bronze on the door. 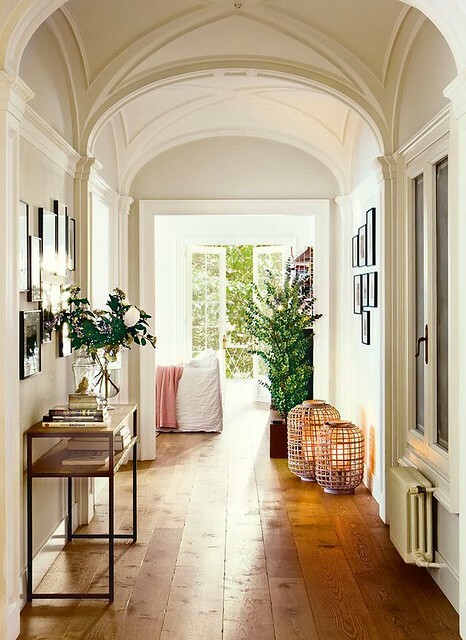 The color palette for this house is lovely and it is no surprise that this image was one of the top pinned images of the month. 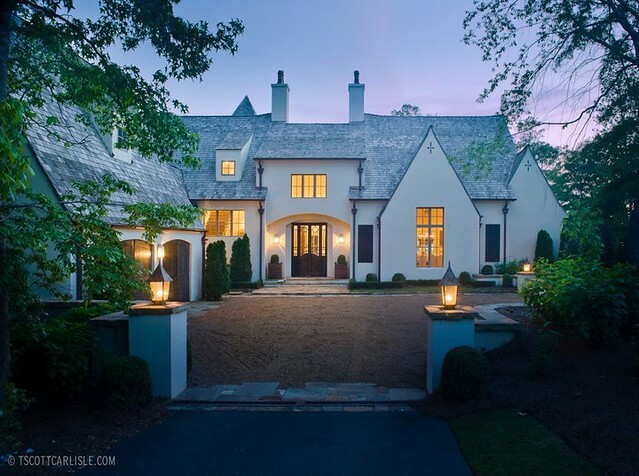 A European style house, image source. 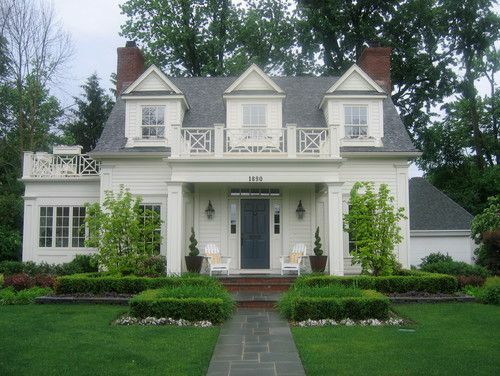 A house with incredible curb appeal, image source. I know some architects aren't fans of the garage in front, but I really like the look and think it is particularly effective with this design. A house on last year’s Georgetown house tour. Image source. 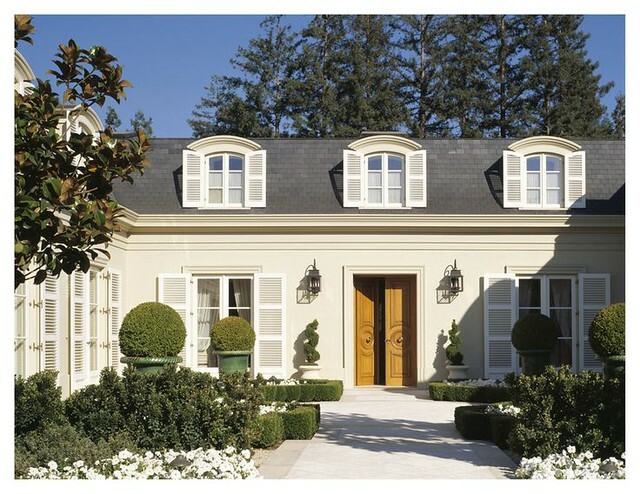 A French style house by Andrew Skurman Architects. The original text on this pin was ‘simplicity’, perhaps because the clean lines and elegant planters and terrace design has universal appeal. A house in Chicago, designed by Burns and Beyerl Architects. 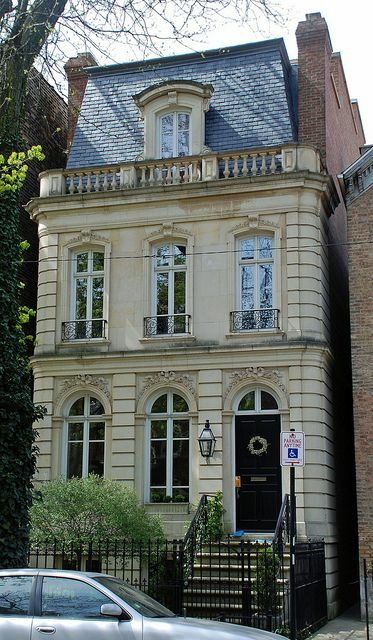 Another Chicago house, image source. It’s interesting how several of the top pinned architecture images of the month are city houses. 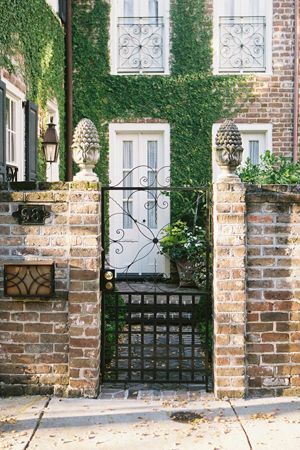 A beautiful gate at the William Aiken House in Charleston. Found on Pinterest. 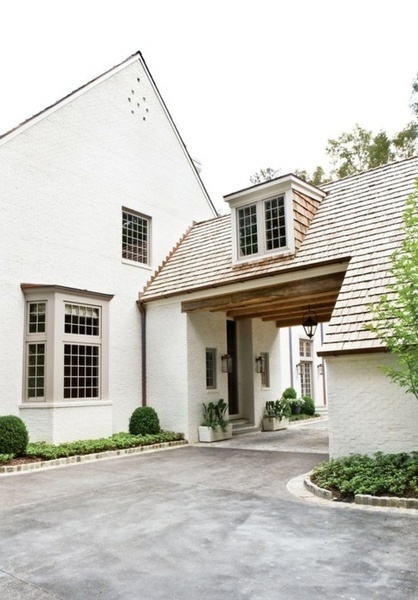 Noted in pinterest as Churchill Cottage, Birmingham, Michigan. Design by Sears Architects. A house designed by architect Peter Block. 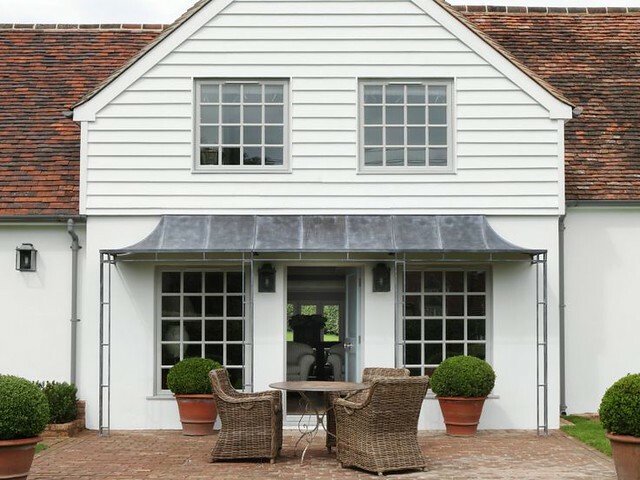 An attractive metal awning, via Ham Interiors. 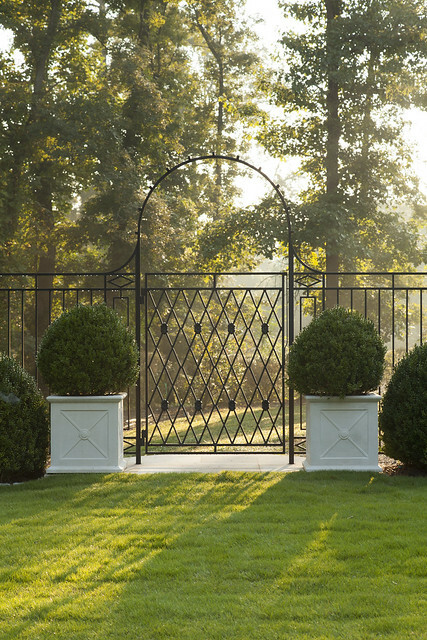 The landscape is the focus of this beautiful back yard, and no surprise that the image came from Lila Fendrick Landscape Architects. I pinned many outdoor rooms this month, but this was the only one that made it to the top pinned category. A house in Vancouver found on Martha Moments. 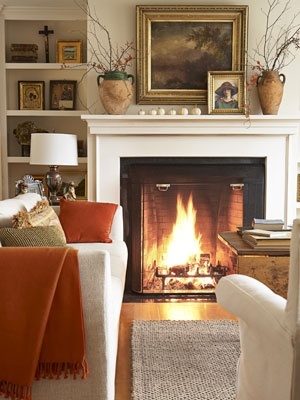 I am intrigued by the freestanding fireplace, and the fact that three distinct flames appear in the space. Note how there is an outdoor dining area up the steps. Not pictured is a fountain on a wall to the right. This is the perfect outdoor retreat! It’s amazing that this is in Vancouver given that the outdoor season is probably not that long. 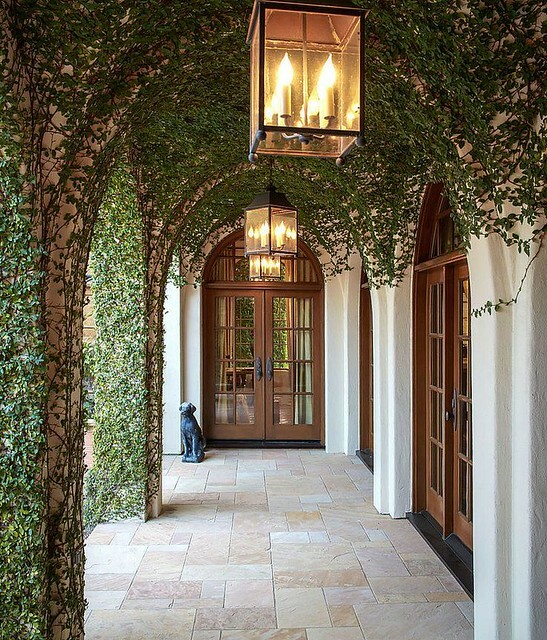 A beautiful image of a covered breezeway with creeping fig, via Thompson Custom Homes. 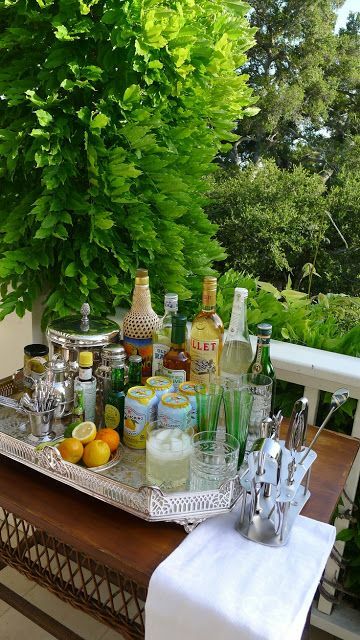 An elegant and simple bar for entertaining, image source. This gorgeous image from my recent post on the Shutze Award winning pool pavilion by Stan Dixon, landscape design by John Howard. See post here. Photo by Emily Followill. 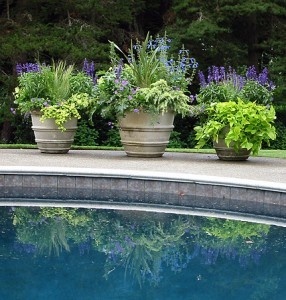 A trio of planters in different sizes makes a beautiful composition. I especially like the color palette of the planters, the plantings, the pool, and the pool decking. From my recent post on planters, click here to see it. 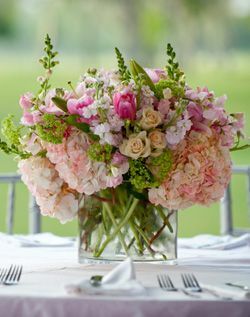 This flower bouquet is the perfect image for spring. Found on Pinterest. 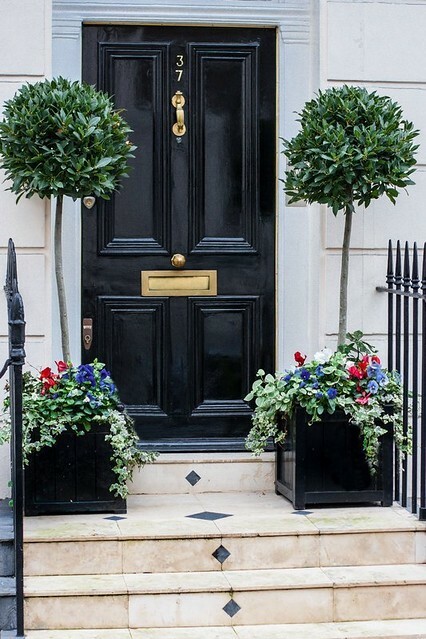 Gorgeous London planters, found on Pinterest. Note the diamond detail on the stairs and the landing too. 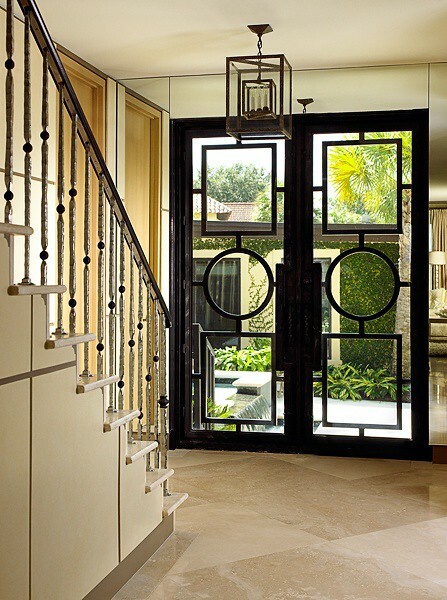 A striking metal door, and note the pattern on the stair rail. William Eubanks Interior Design. A classic guest bedroom by Phoebe Howard made the top pinned list. 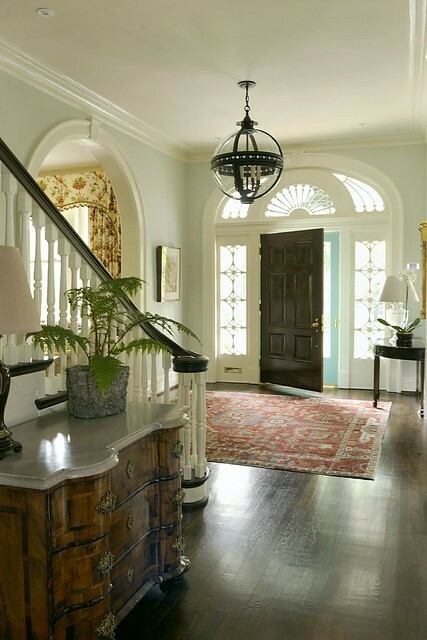 A lovely entry by Matthew Carter Interiors. 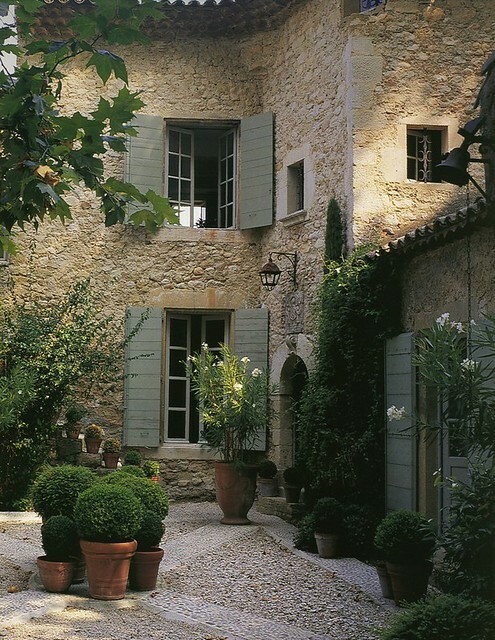 Noted as interior designer Meritxell Ribe’s home, image source. A beautiful living room, image source. 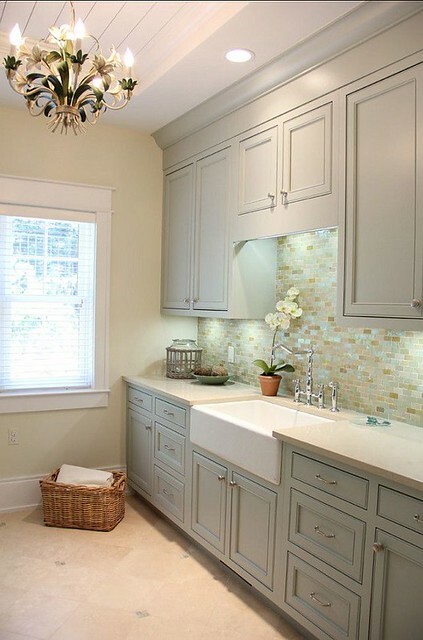 A gorgeous neutral (but not white) laundry room in taupes and grays, by Sears Architects. 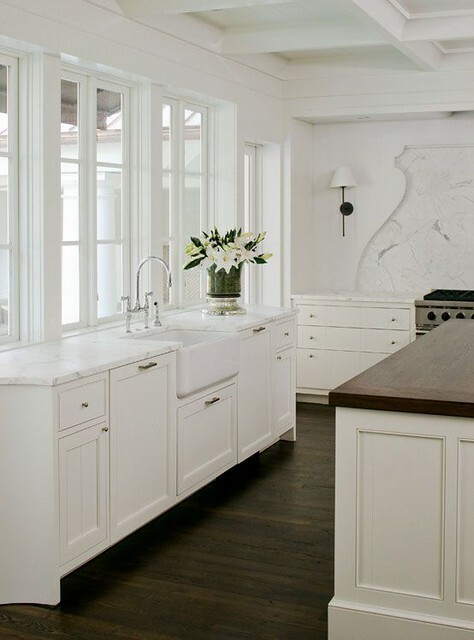 A beautiful white kitchen by Ruard Veltman Architecture. I think the design detail on the back wall is fascinating – the marble appears to be under the wood, and the curve is carved into the wood rather than the marble. 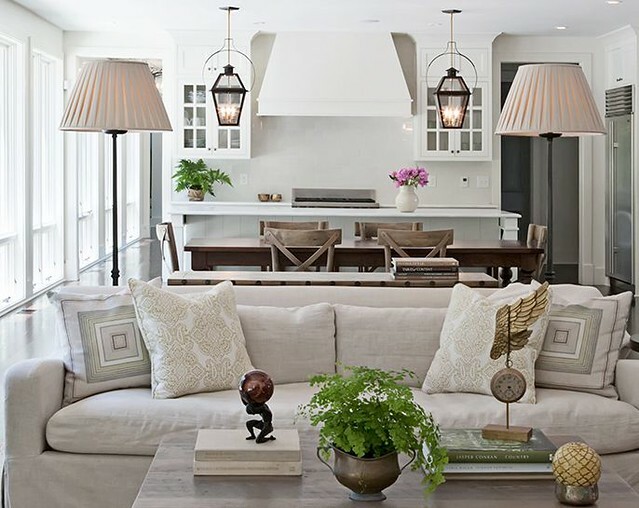 A beautifully designed kitchen/family room from Rachel Halvorson Designs. 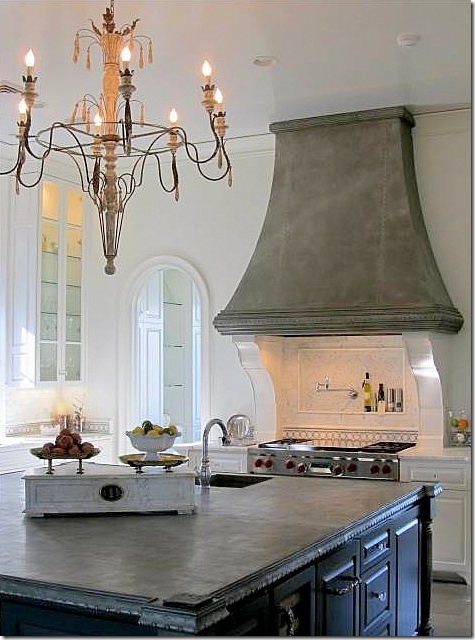 A beautiful kitchen seen on Cote de Texas. I really like the chandelier – does anyone recognize it? A kitchen found on Pinterest captured a lot of attention. 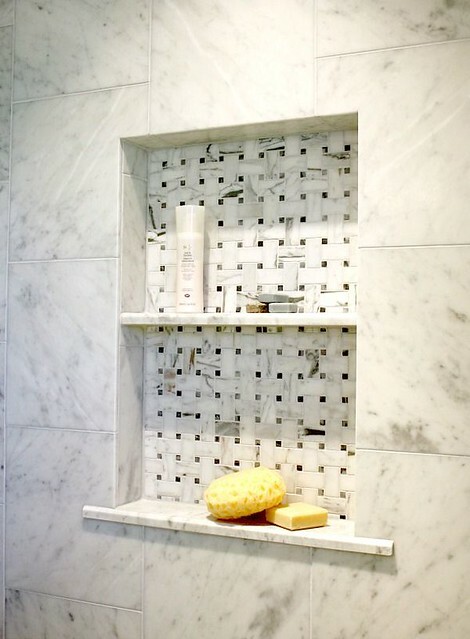 This is a clever and attractive design for a shower niche. Via Bright Bold & Beautiful. Only one recipe made it to the top pinned this month! I didn’t pin a lot of recipes as I was not in cooking mode due to spring break and general spring fever. This looks like a good one, though! 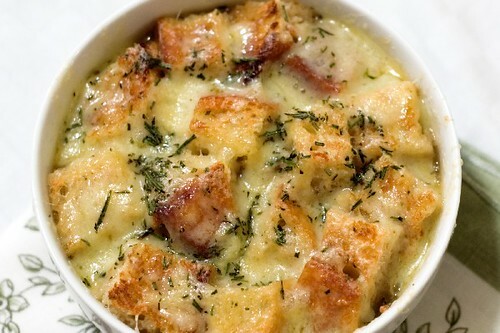 Onion soup with fontina and thyme, original recipe can be found here. 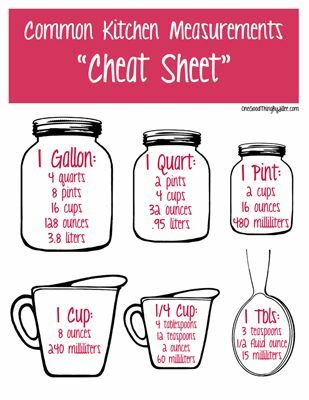 A handy reference for kitchen measurements, found on One Good Thing by Jillee. I printed it out and hung it on my bulletin board. 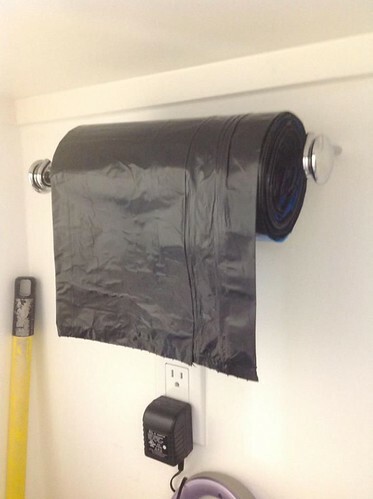 A great idea for trash bag storage – a paper towel holder - found on Pinterest. 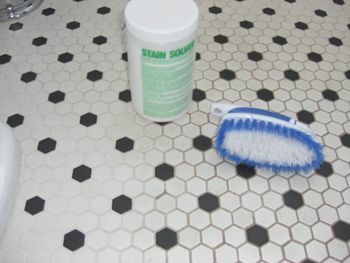 Easy tile cleaning advice: powdered oxygen bleach, a scrub brush, and water. Photo credit Tim Carter, found on Ask the Builder. Love this one: What’s Your Stain, a definitive guide for dealing with just about any kind of stain. The original source is here. 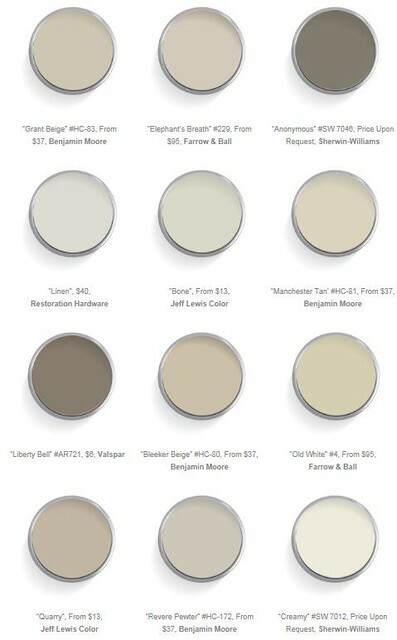 A great collection of warm neutral paint colors, from Domaine Home. An interesting idea for laundry cabinets (although I can’t say I have seen built in cabinetry for laundry machines that frequently) but I can see how this would be very good for the back! Image source. 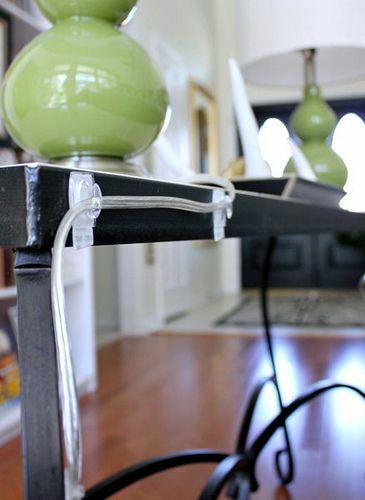 A smart idea for hiding lamp cords – using clear command hooks! See the full tutorial here on Hi Sugarplum. I looked on Amazon and it appears that there are small clear command hooks, mini hooks, and decorative hooks. Based on the pictures in the tutorial, the author used a combination of a few sizes. This looks like it would be a great idea for hanging Christmas lights on mantels and around doors too! This was the top pinned image of the month! I love it when the image contains the instructions too. 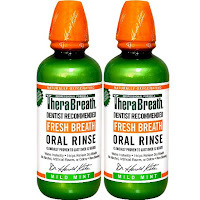 I just ordered some lavender essential oil on Amazon (this one is the #1 best seller and has great reviews). Do you have a favorite image in this post? Click here to comment. Thank you for sharing, Hollly Had to pin a few of these. You have the best pins! I guess I'm a bit partial to the Laurel Crest Wreath, lol. Don't know the exact source of the chandelier. Aidan Gray has some similar styles, however. Gorgeous images Holly! Holly I happened to pin several of these! Great images all! This was the best Things That Inspire of all time. 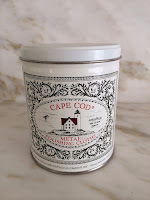 I can't wait to take the bath; the recipe and the photos were inspiring and just what I needed. 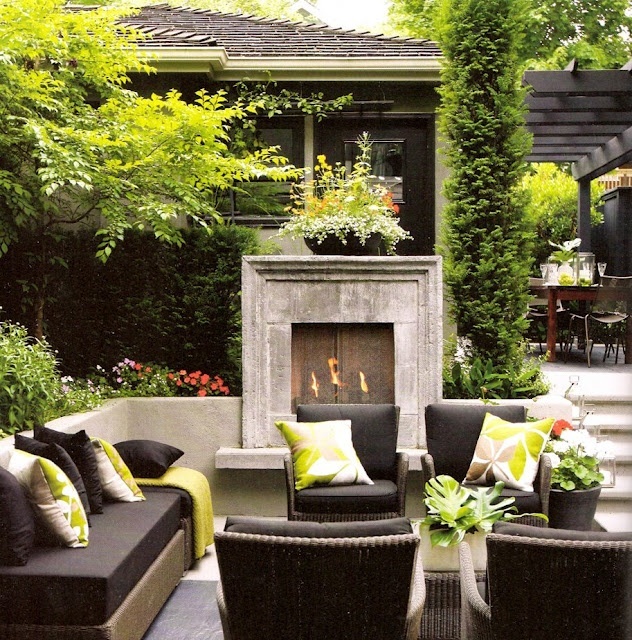 I love the back yard designed by Lila Fendrick Landscape Architects. But there isn't anything in this batch that I don't love! I cant just pick one, there were so many all different and lovely for different reasons!! Wonderful post! Beautiful images! 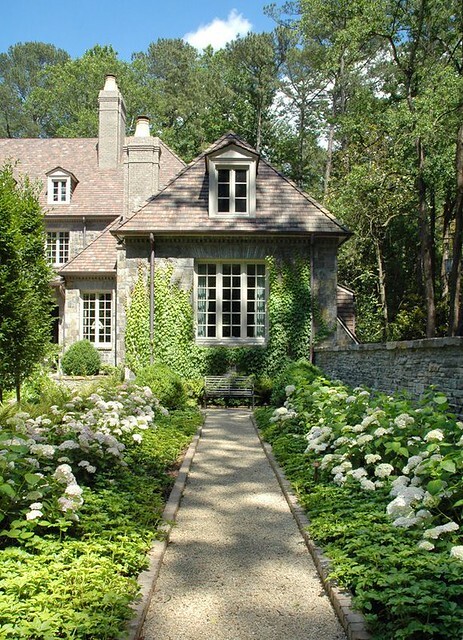 I especially love seeing the outside of a home. These were lovely and make me wish I was one of those painters who specialize in doing a "portrait" of your home. I'd like to have all of them! Some wonderful inspiration here, a large focus on townhouses it seems! All the pins are lovely!! Vancouver has one of the best climates in Canada so that outdoor space is probably well used. I am not sure why the epsom salt pin leads to this, but it drives me crazy because its WRONG. A "handful" of epsom salts will do NOTHING. 2 cups WILL. 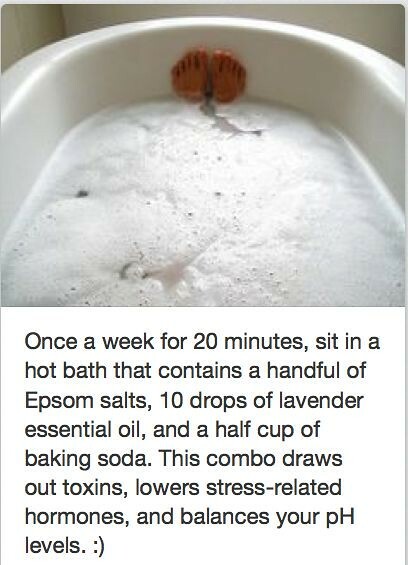 I hate that hundreds of people are pinning this and that bath will do nothing. I can't pick one favorite….there are so many ones I love. The first image, the London front door (our shared love! ), the metal awning, the backyard with all the sitting areas….as always, you select the best! Hope Spring has sprung in Atlanta. We're still waiting up here!! I tried the bath, it was very relaxing. However, I didn't get the foaming action like in the picture. But I still really enjoyed it.